STAN FREBERG: Look, you can do things on radio you couldn’t possibly do on tv. FREES: That’ll be the day. FREBERG: All right, watch this…ahem, okay people, now when I give you the cue, I want the 700 foot mountain of whipped cream to roll into Lake Michigan, which has been drained and filled with hot chocolate. Then the Royal Canadian Air Force will fly overhead towing a 10-tom maraschino cherry, which will be dropped into the whipped cream to the cheering of 25,000 extras. All right – cue the mountain! Freberg was inducted into the National Radio Hall of Fame in 1995. Freberg was close friends with Ray Bradbury. Ray served as best man when Stan married his first wife, Donna — Ray having introduced the newlyweds. 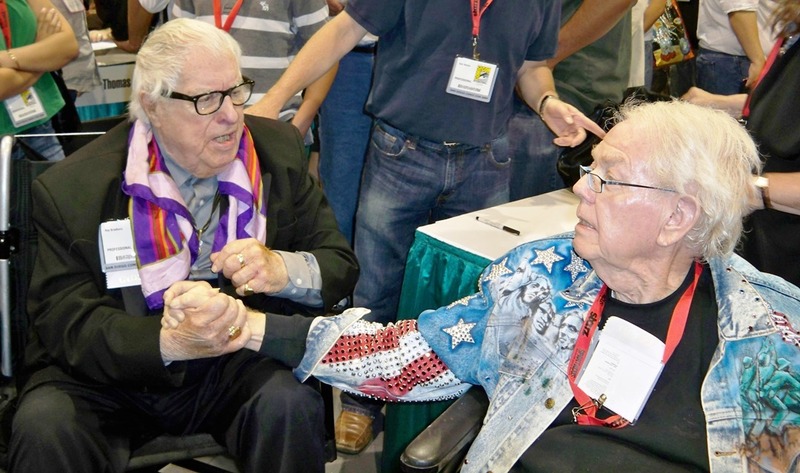 The two friends had a reunion in the aisles at the 2009 Comic Con when Freberg was 82 and Bradbury was 88 — both made the rounds in wheelchairs. Just a few years later Freberg was among the speakers at Comic Con’s Bradbury memorial (2012). Stan was the guy who’d been at it the longest. He recorded his first cartoon voice roles in 1945 for release in 1946. As far as I know, his last job was in an episode of The Garfield Show I voice-directed last year. It’s currently scheduled to run on Cartoon Network this October, giving Stan a career span of 69 years. Once when Frank Sinatra toured Australia, he took along Freberg as his opening act. Freberg’s first wife, the former Donna Andresen, died in 2000. In addition to his son, Donavan, he is survived by his wife, Hunter; his daughter, Donna Jean; and one granddaughter. Update 04/11/2015: Corrected info about Bradbury introducing Freberg to his wife — it was Donna that Ray introduced to Stan. This entry was posted in In Passing and tagged Jerry Beck, Mark Evanier, Stan Freberg by Mike Glyer. Bookmark the permalink. This is the first commercial I ever had a 16mm film copy of. Interestingly, I ended up working at an ad agency who had the Lark account in the late 1970’s. We joked about the old “Show us your Lark pack” commercial, but I would always bring up the Jeno’s commercial. For some reason, I think I want to eat a Sunsweet Pitted Prune in Mr. Freberg’s memory. RIP, Sir. The other day one of Ray Bradbury’s daughters told me how Ray and Stan would put on skits for the kids (Ray’s four and Stan’s two) while the moms (Maggie and Donna) would just roll their eyes at the silliness. No doubts about Freberg’s genius. His creative scope was huge. He should have been a big TV star on top of every other field he conquered, but I guess he was just too eccentric for the networks. Thank goodness for his work with Bob Clampett. The few episodes of the puppet show that I’ve seen were truly eccentric and delightful — much less commercial than the later cartoons, which I did grow up on. It’s also worth noting that Bill Rotsler was for many years one of Freberg’s friends and occasionally provided his services as a photographer when Stan needed one. 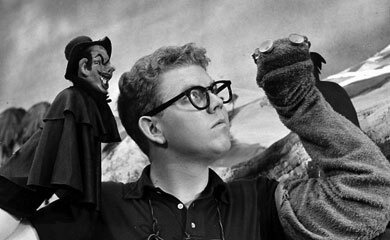 I understand that in the late Fifties, Bill also designed and made some puppets for one of Stan’s productions — I don’t know which one. When I asked Bill about it once, he said that they were essentially typical Rotsler characters made from felt. I wonder if they’re still in his archives? Sigh. Anther one bites the dust. I want to say I first learned of Freberg on the Dr. Demento show, and it wasn’t until later that I realized how many funny things he had his hand in popular culture. He was all over the map in the 1950’s. He had two radio series, was doing his popular music parodies, and starred in two films, many TV appearances and did world tours. And of course, hundreds of cartoon voice overs. I have seen GERALDINE, which he re spoofed Johnnie Ray, singing a song titled “Flaming Lips” and tearing off his clothes (he was kind of furry). I really liked his second radio series. The two LP set was issued. When the family was in Germany in 1960, it got many many plays.